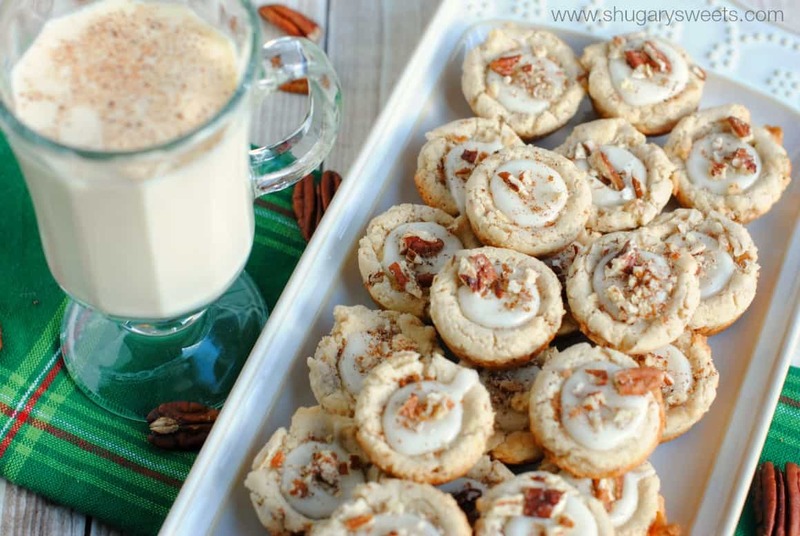 Delicious, melt in your mouth, Pecan Egg Nog Cookies. These little cups will be all the rage at your next cookie exchange. Or keep them for yourself! I love those store bought pecan sandies cookies, the kind that crumble in your hands and your mouth! LOVE them. Today’s recipe is similar except they are all decked out for the holidays. With egg nog! 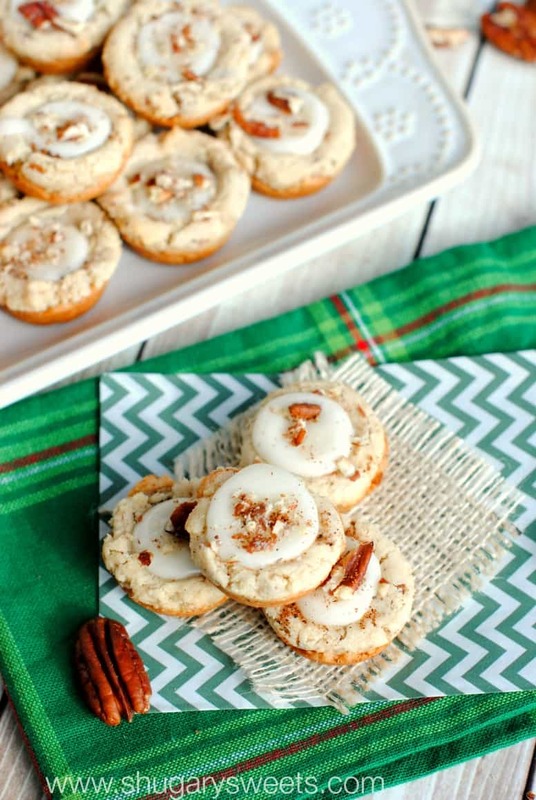 The cookie is made with some finely chopped pecans and tastes similar to a shortbread. The dollop of eggnog flavored glaze on top with extra Fisher pecans is the perfect finishing touch! I know this time of year everyone is busy. Busy shopping. Working. Wrapping presents. Holiday parties. Christmas baking. And the list goes on. If you’re still trying to figure out what you want to bake this holiday, look no further. 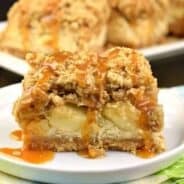 Seriously these will have your friends and family begging you for the recipe! It’s that good. If you are still working on your dinner menu, you need to try this Walnut and Fontina Macaroni and Cheese recipe. Last month I had the opportunity to fly to NYC, courtesy of Fisher Nuts, to attend a cooking demo by Alex Guarnaschelli. You know, the chef from Chopped. I love her on that show. Meeting her in real life was awesome, and seeing her prepare food and talk about it was even more amazing. I love that she is so real about food. If something tastes bad, she tosses it out and orders a pizza! It’s good to know she has bad days too. And when stuck in a recipe rut, she suggests you get out and be inspired. Go out for mexican food and relax, and ironically that new cookie recipe idea may just come to you! So true. Anyways, some of my fellow bloggers and I had the opportunity to enjoy some of her Fisher Nut creations in her beautiful restaurant, Butter. Hands down, no doubt about it, her recipe for Walnut and Fontina Macaroni and Cheese was my favorite. I couldn’t wait to enjoy seconds and thirds (oh yes I did)! Be sure to check out some of her other recipes on the website! to make these. The recipe makes exactly 48 cookie cups! And the flavor you guys is out of this world! I love using products in my recipes that just give such a depth of flavor. I didn’t toast these Fisher pecans in today’s recipe, and yet the nutty fresh crunch was still present in every bite! ENJOY!! 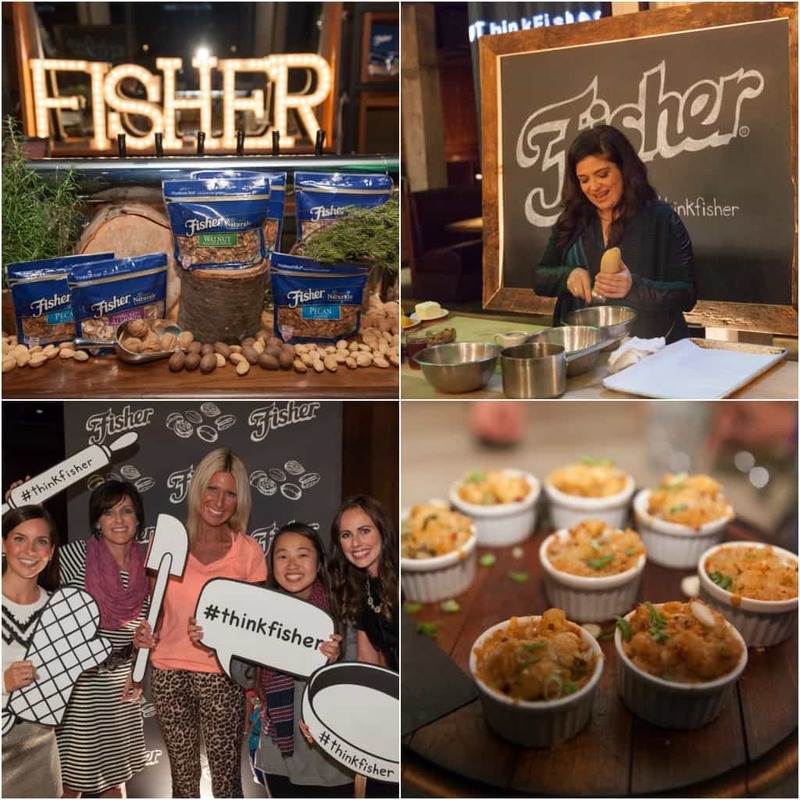 This year while planning YOUR holiday menu, think Fisher. For the cookies, combine butter and powdered sugar in large mixing bowl. Beat until fully combined. Add in salt, flour, cornstarch, rum, nutmeg and egg nog. Beat until it becomes a soft dough. Fold in chopped pecans. 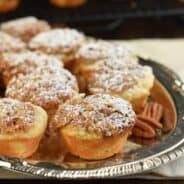 Drop by large tablespoon into a greased mini muffin pan. Bake for for 13-15 minutes in a 350 degree oven. Remove from oven and cool in pan 3-5 minutes. Remove from pan and cool completely on wire rack. For the glaze, whisk together the powdered sugar with egg nog until combined. Drop a small teaspoon on top of each cooled cookie cup. Immediately sprinkle with chopped pecans and a pinch of nutmeg. Allow to set, about 15 minutes. ENJOY! store cookies in an airtight container in the refrigerator for up to one week. 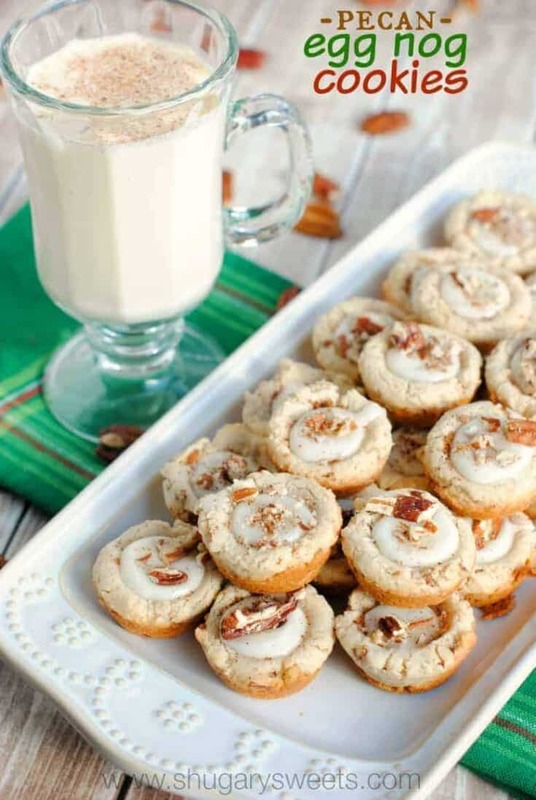 What is YOUR favorite way to use Fisher Nuts for holiday baking? **This is a sponsored post on behalf of Fisher Nuts. I was compensated for my time and recipe development, however all opinions expressed are 100% my own! Congrats on your new deal with Fisher Nuts! These little eggnog cookie cups look delightful. Tis the season to put eggnog in everything. And I love it! 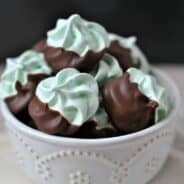 I definitely must make these soon! What a deliciously perfect little Christmas treat! These cookies would go fast here! We LOVE pecans! 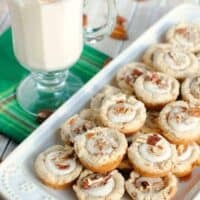 I LOVE pecan sandies! I can only imagine how amazing these must be, especially with the eggnog glaze! Thank you for the recipe! They look great! Do you think these cookies could be made with rice flour? I love all the flavors in these. The event must have been so much fun. Looks like you had so much fun and the cookie sound amazing! Love the flavor combination! Perfect Christmas cookie! Love me pecan sandies, then add eggnog and they go to a whole new deliciousness level! YUM!! Looks like you had a fabulous and inspiring time in NYC! And oh my, these cookies. So cute, so perfect for holiday parties/hoarding all for myself. I certainly have the busy working & holiday baking down… But shopping, wrapping presents, and holiday parties?? GAH I haven’t even thought about any of those. Please don’t remind me Christmas is next week… But hey, if I showed up with a tray full of these cookies, maybe nobody would notice the lack of presents! 😉 Pinned! I’m pretty sure to love any dessert with pecans involved. These cookies look delicious.